Stephen Robertson Director-General of the British Retail Consortium was the Eeyore of business yesterday as he spread doom and gloom across the media. Offered a chance by interviewers to say something positive, Robertson would effortlessly bridge and make a point even more dire than the one before. Don’t we need some cheerleaders as the downturn bites, rather than just these doommongers? That’s not good news? Only if you are a bit old-fashioned and don’t understand and value the internet and ecommerce as a vital retailing channel. For the army of eBay sellers out there who are considering taking some or all of their sales to their own website or another marketplace, this is good news and should be a spur. If you’re a small business who wants to do more online in 2009, is good news. The dinosaurs at the BRC, who are wedded to the High Street and lack online vision, are concentrating on the meteorite. But the online mammals of retail are looking to the future and perhaps permitting themselves a little warm-blooded optimism. (Stop press: just read that Stephen Robertson “most recently… served for 3 years on the retail board at Woolworth plc.” So, no wonder he’s down in the dumps but he doesn’t need to tar us all with his brush. 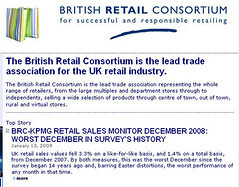 It says something for the British Retail Consortium that their DG and spokesman is a man who has just (with others) presided over one of the most publicized high street failures in many a year. Ha! Sock it to him, Danny. Still, John Varley and the other Barclays bods who are currently getting hammered, pretty much for putting self interest over shareholder interest, are now generating enough negative newsflow to bring back memories of Sept/Oct calamity newsflow, with or without the “chump” Robertson..